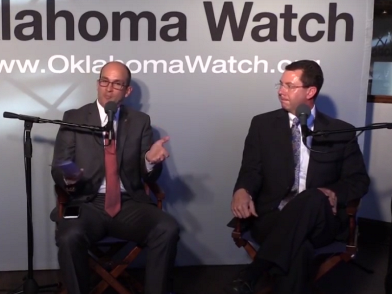 Greg Mashburn, Oklahoma District 21 District Attorney (left), and Kris Steele, Executive Director of The Education and Employment Ministry (right), debate State Questions 780 & 781 during an October 18, 2016 Oklahoma Watch-Out forum in Oklahoma City. State Questions 780 and 781 propose making significant changes to Oklahoma’s criminal justice system in an effort to lower the state’s incarceration rates. SQ 780 proposes to change the classification of certain drug possession and property crimes from felony to misdemeanor offenses. SQ 781 would create the County Community Safety Investment Fund to hold and redistribute any savings achieved by incarcerating fewer people for drug possession or nonviolent crimes — the intent of SQ 780 - to counties for mental health and substance abuse treatment programs. Kris Steele, former House speaker and executive director of The Education and Employment Ministry (TEEM), and Greg Mashburn, district attorney representing Cleveland, Garvin and McClain counties, debated the measures and issues at play during a recent OK Watch-Out forum in Oklahoma City. Join KGOU Sunday, October 30, 2016 at noon for the results of the discussion during this week's Sunday Radio Matinee feature presentation.